Our online registration forms require donors and other users to give us contact information that may include name, email address, format preference (HTML vs. Text), physical address, interests, and similar information. Donors and other visitors who sign pledges, make donations, send eCards, or request our email or offline updates are added to our mailing list. We do not request or store sensitive information from our online or offline donors or visitors, such as social security numbers or credit cards (unless required for a donation). For online transactions, credit card numbers and bank account (ACH) information are used only for donation processing and are not retained for any other purposes. All online transactions, including recurring donations, are managed by credit card and ACH processors. For offline transactions, credit card numbers and bank account (ACH) information are used only for donation processing and are encrypted. PCI DSS requirements are strictly followed for online processing. SNRF will not share, rent, or sell donor or visitor email addresses or telephone numbers with outside organizations. SNRF may occasionally share our mailing list, which includes only donor names and postal addresses, with other respected organizations. However, if you do not want us to share your name and postal address, please e-mail us at info@snrfprograms.org to let us know and we will adhere to your request. SNRF does not send mail to our donors on behalf of other organizations. All information provided to The Sioux Nation Relief Fund is transmitted using SSL (Secure Socket Layer) encryption. SSL is a proven coding system that lets your browser automatically encrypt, or scramble, data before you send it to us. We also protect account information by placing it on a secure portion of our Site that is only accessible by certain qualified employees of The Sioux Nation Relief Fund. Unfortunately, however, no data transmission over the Internet is 100% secure. While we strive to protect your information, we cannot ensure or warrant the security of such information. If any donor or visitor elects to use our online referral service to inform a friend about our Site, we ask them for the friend's name and email address. The Sioux Nation Relief Fund will automatically send the friend a one-time email inviting them to visit the Site. The Sioux Nation Relief Fund temporarily stores this information for the sole purpose of sending this one-time email. After the email is sent, the information (friend’s name and email address) is promptly removed. Our Site contains links to other Web sites. 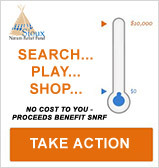 Please note that when you click on one of these links, you are entering another Web site for which The Sioux Nation Relief Fund has no control or responsibility. We encourage you to read the privacy statements on all such sites as their policies may differ from ours.